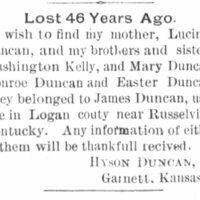 Several people enslaved by this Duncan family, of Logan County, Kentucky, sued the Duncans for freedom in the St. Louis, Missouri Circuit Court. See scholarship by Anne Twitty, Kelly Kennington, Lea VanderVelde, Robert J. Moore, Jesse Nasta, etc., on the antebellum St. Louis freedom suits. 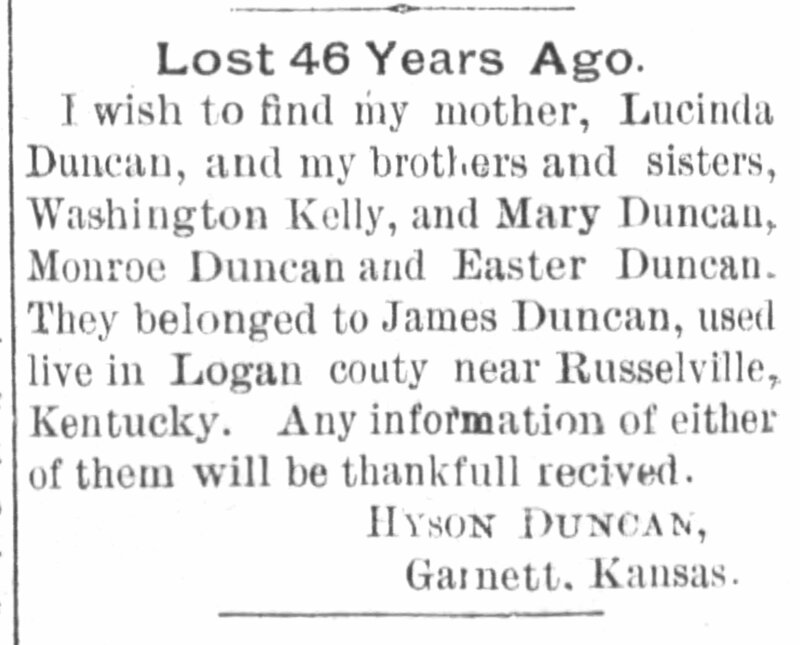 “Hyson Duncan searching for his mother, brothers, and sisters,” Information Wanted Ad, Baptist Times (Garnett, KS), March 1892 [published in a monthly African American Baptist newspaper], Last Seen: Finding Family After Slavery, accessed April 19, 2019, http://informationwanted.org/items/show/3435.